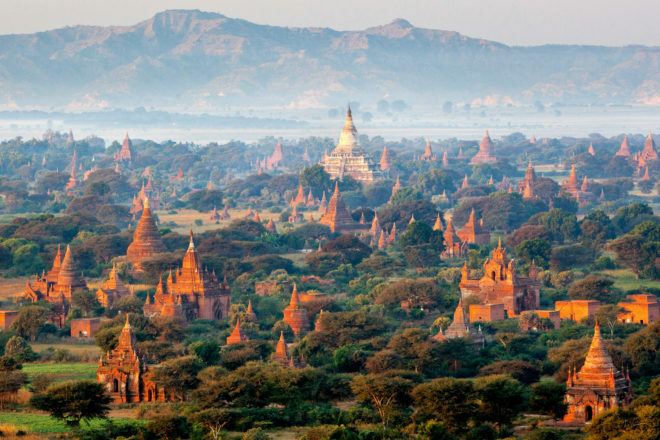 As stunning as it is historically significant, this the ancient city of Bagan in Myanmar. As stunning as it is historically significant, this the ancient city of Bagan. As the sun sets thousands of spires that comprise the ancient city of Bagan catch the evening light. Located in the heart of Myanmar, formerly Burma, the city was the capital of the Pagan Kingdom from the 9th to the 13th century. At the time, around 10,000 Buddhist temples were built; around 2,200 of the pagodas remain today. It’s become a major drawcard for visitors to the country, which only became a viable tourist destination relatively recently. Now that people are returning, so too have the Burmese moved back to Bagan. However, to preserve the beauty of the place no settlements are allowed in the archaeological site, with nearby towns and villages servicing the area. Today, you can walk around the many temples or take a hot air balloon ride to get a sense of its vast scale.